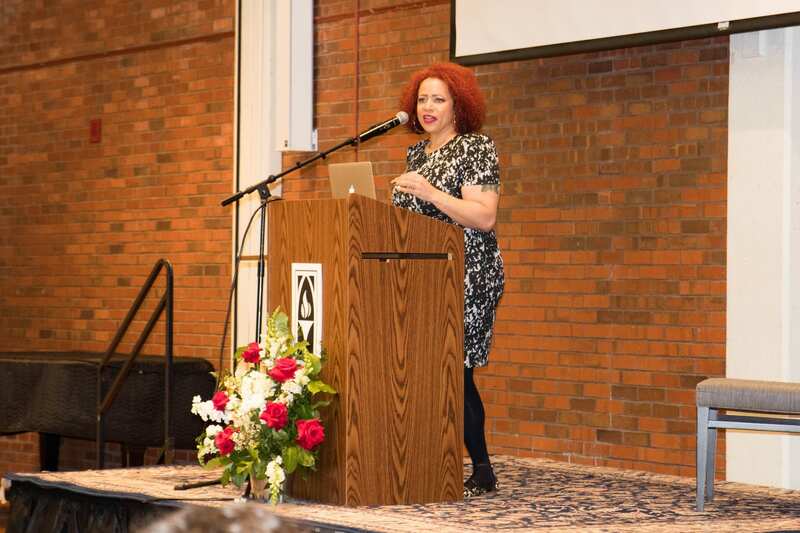 On Friday, January 25, the Humanities Forum hosted Nikole Hannah-Jones, a staff writer at the New York Times Magazine. 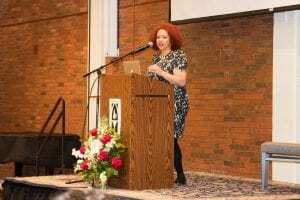 Hannah-Jones came to Providence College to discuss her upcoming book Choosing a School For My Daughter in a Segregated City, adding to the special events organized for Martin Luther King Jr. Day. Hannah-Jones began her speech by saying how this will not be an uplifting speech, as the struggle for racial equality is not uplifting either. She aimed to focus our attention on how racial inequality affects American children in schools. However, despite the ideal goal of public education systems, Hannah-Jones pointed out that there have always been two philosophies for education: one for democracy for white children, and one for oppression for black children. Following her introduction about the racial inequality currently present in America, Hannah-Jones explained that if we want to understand racial inequality we must look back at the history of our nation. She brought up the Declaration of Independence, except Hannah-Jones mentioned a fact that not many people know about Thomas Jefferson, the original writer of this significant document. Hannah-Jones went on to mention a very significant year, 1976, the year of her birth. During this part of the speech, Hannah-Jones made some captivating points, claiming that eight years before she was born, it was legal to deny someone housing because of African ancestry, and how 11 years before it was legal to deny black people the right to vote in certain parts of U.S., as well as deny black people access to public pools, libraries, and restaurants even though their taxes helped pay for these establishments. Hannah-Jones commented on how it is disappointing to know that all of these things were legal right before she was born about 50 years ago, proving her point that racism has not and will not go away unless action is taken. She explained that we like to pretend that these racist actions took place a very long time ago, but in reality, they did not. She then posed the question that many people across the country may sometimes ask themselves: Why do black Americans still complain about inequality when they have their rights now? Hannah-Jones responded with a simple answer, stating that racism is embedded in our country, regardless of the so-called “equality” given to African-Americans by the law. Hannah-Jones then dug deeper into history, discussing how it is necessary for us to recall the times of slavery because slavery forms so much of the racism we see today. She mentioned the stereotype that black people are people who do not value an education. However, she then mentioned that despite it being illegal for slaves to read and write, many did anyway even though they could be brutally punished if they were caught. Slavemasters feared that once the slaves started to read, they would begin to challenge their circumstance and become more difficult to control. For black Americans, education meant they would be free; it was not about getting a high-paying job. Hannah-Jones then explained that once black people were given the right to education, it was no surprise that their educations would be inferior to white people. Black children were originally left out of commonly funded schools. Hannah-Jones stated that once allowed into these schools, it was ensured that they would be given an education that taught them how to stay in their place and remain inferior to their white peers. She claimed that the inequality we see today is because of how we use schools as a form of social control for black students, but as a form of liberation for white students. Hannah-Jones continued to emphasize the racial inequality prevalent in today’s society despite years and years of attempting to end racism for good. She claimed that it is upsetting that we can predict the quality of the education children will receive based on the color of their skin. She ended her speech by mentioning how she decided to enroll her daughter in the school that the kids in her neighborhood went to, instead of busing her off to a different school in a different district in an attempt to better her education, as many people still do. Hannah-Jones claimed that she could not say the system was wrong, but then act like a hypocrite by busing her kid off to a predominantly white school. She claimed that if each of us fights for equality, but make choices that are unequal, we are repeating the cycle and hindering the racial progression of our country. Hannah-Jones’ last words were “Hope is an action,” meaning that, if we hope to see racial equality in the future, we must take action and not feed into the vicious cycle that was established decades ago. We must take action and try to be better than we were today so that our children can stop living in a world of segregation.